CANSEC 2019 will be held at the EY Centre, located at 4899 Uplands Drive in Ottawa, Ontario. The EY Centre is conveniently located near the Ottawa Macdonald-Cartier International Airport and is just minutes from downtown Ottawa by car or public transit. Drag and Zoom map OR click the "Get Driving Directions" in the information box to get directions from your location. By Private Vehicle: If you are planning on driving to the Show, access to the EY Centre by private vehicle will be from Uplands Drive; there is limited parking on site which is free. Please ensure all passengers are prepared to show confirmation of registration or your delegate badge and photo ID/government employee ID at the Security Check-Point at entrance of the show site. 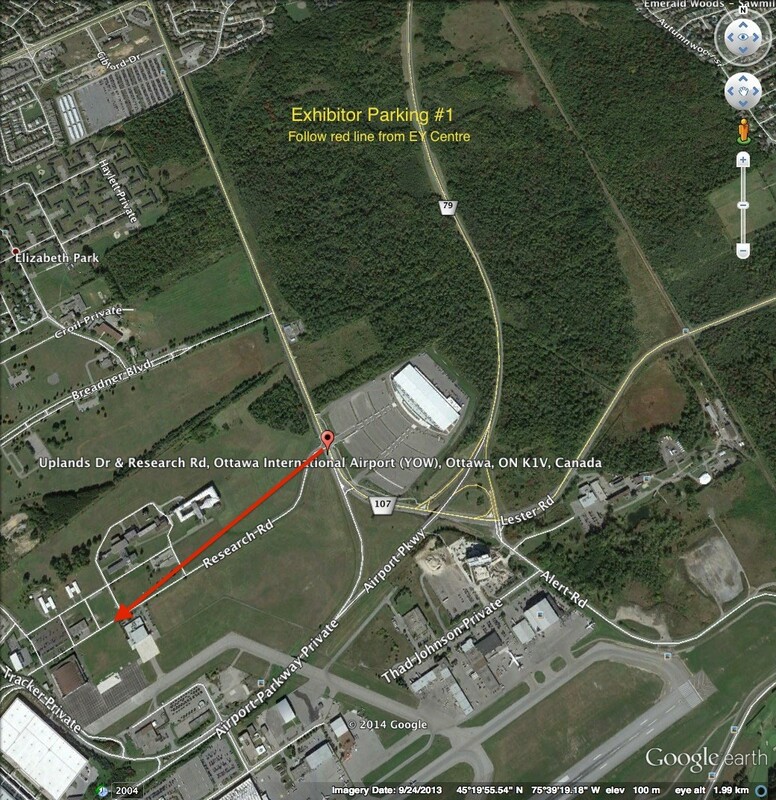 Over flow parking during peak times will be located across the street from the EY Centre and the NRC grounds. Parking at the facility is restricted to visitors ONLY on show days; employees and contractors of Exhibiting companies will be required to park in the Exhibitor Parking located across the street from the EY Centre and the NRC grounds. Free L3 Technologies Shuttle Bus Service: Free daily shuttle service is available from different major federal buildings throughout the National Capital Region. Pick-up locations and times will be available shortly. Taxis: Taxi access to the show site will be via the Main Entrance from Uplands Drive. A taxi stand will also be available on-site for departures from the park. Please be prepared to show your confirmation of registration and photo ID at the Security Check-Point at entrance to the show site. Please note: Uber and Lyft Taxi Services will not be permitted on the grounds of the EY Centre. OC Transpo: If you are taking public transportation to the Park, a gate will be available on Uplands Drive for participants arriving on foot. Please be prepared to show your confirmation of registration and photo ID/government employee delegate badge at the Security Check-Point at the entrance to the show site.